Cue Card made a late charge to edge out long-time leader Vautour and win the King George VI Chase at Kempton at the fourth time of asking. The nine-year-old (9-2) looked beaten at the final fence but dug deep under Paddy Brennan for victory. Vautour and Ruby Walsh had been at the head of the field for much of the three-mile test of stamina. The 15-8 favourite Don Cossack fell with two fences to go while well in contention and Al Ferof finished third. Two-time winner Silviniaco Conti was pulled up after a disappointing run. Cue Card, trained by Colin Tizzard, underwent surgery on a trapped epiglottis in February and has been in superb form this season with wins in the Charlie Hall Chase at Wetherby and Haydock's Betfair Chase. This success puts him in line for a £1m bonus on offer to the winner of the Betfair Chase, the King George and then the Cheltenham Gold Cup in March. Vautour, bidding to become the first Irish-trained winner since Kicking King in 2005, looked the more likely to triumph as they turned for home but a jumping error at the second last gave Cue Card a chance. The pair fought it out to the line with Cue Card getting his nose in front in the final couple of strides to win by a head with Al Ferof third for the third year in succession, this time for Dan Skelton. "It's the best feeling of my whole career," said Brennan. "I can't take it in. I've beaten one of the best horses in training and beaten one of the best jockeys I've ever ridden against. My wife and son watching at home will be so proud. "For people that say he doesn't stay, he stayed right to the line to get there." Tizzard added: "Nowadays he's a completely different horse, he might not look as if he's going very well but he has that left for the end. It's fantastic. "He's been a great horse for five or six seasons now. Going to the last, if he'd met it on a good stride he'd have won easier. "We'll see how he is, but he looks like a Gold Cup horse now, whether he races again [before Cheltenham] I don't know, he's had a hard race and was all out." Vautour's trainer Willie Mullins said it appeared that a lack of stamina cost his horse. "He did everything right, bar the last 20 yards," he said. "He didn't jump the last as efficiently as he could have, but it was a very brave run, as it was from the winner. I don't know if his stamina gave out, but it probably looks like that." Paddy Brennan was fined £4,200 and banned for 11 days for excessive use of the whip in winning on Cue Card. And Ruby Walsh also fell foul of the officials, picking up a two-day whip ban. 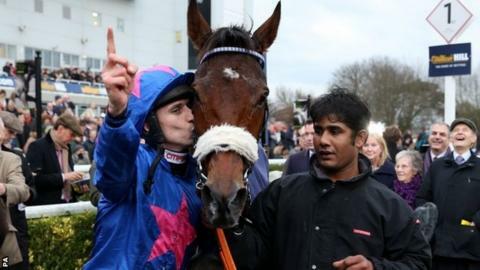 "The charismatic Cue Card, who'd been beaten in this race three times and written off by some prior to this season's rejuvenation, deserved this scintillating success. "Moreover, the Tizzards' base, on a farm in rural Britain - jumping's roots - makes the whole story a classic, heart-warming example of national hunt racing at its best. "But yet another thrilling race-finish has ended in the stewards' room with whip bans being handed down. Whether the rules are too harsh or the penalties not strong enough will be long-debated, but racing needs to get something sorted."